Home / Alcoholics Anonymous (AA) / What Are the 12 Traditions? Alcoholics Anonymous, often referred to simply as AA, is an international fellowship of people working together to overcome their addictions to alcohol. Although it is founded on Christian philosophy, the group is apolitical. It is also multiracial, nearly everywhere in the world, nonprofessional, and self-supporting. The system of mutual peer support to abstain from drugs and alcohol, with the help of a sponsor who has gone through the program, is open to anyone who needs help. It is one of the first organizations to recognize the need for social support in ending alcohol addiction. The original book, Alcoholics Anonymous, was published in 1939, and it has been read by millions of people over the decades when they, or their loved ones, need to end abuse of alcohol. The founding principles of AA are called the 12 Steps, and programs that are based on AA are sometimes called 12-Step programs. The 12 Traditions are associated with the 12 Steps, and they were first officially published in 1946 in AA’s journal, the AA Grapevine. They were officially endorsed as positive cultural attitudes and principles that could bring about change within AA groups by the International Convention of AA, which met in Cleveland, Ohio, in 1950. 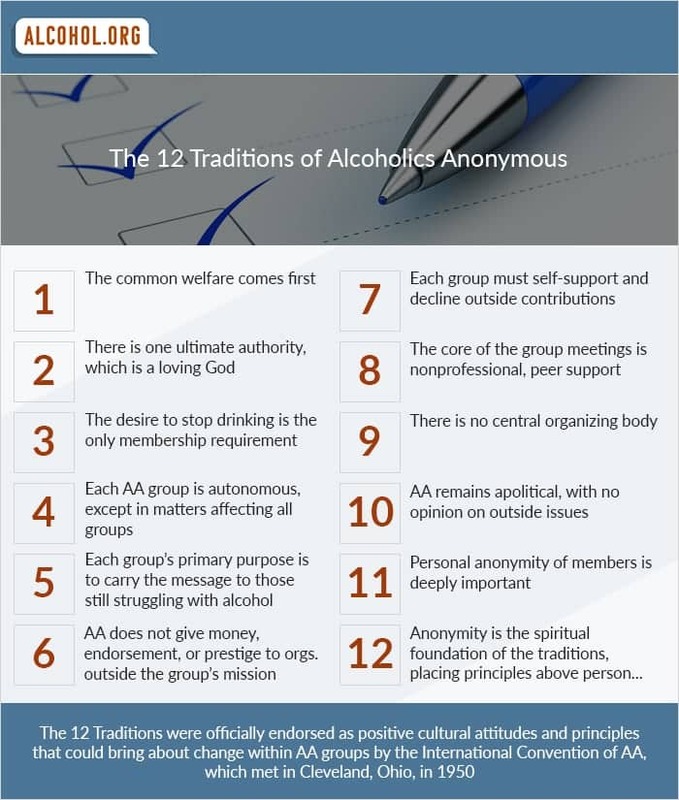 The 12 Traditions in Alcoholics Anonymous are outlined below. The common welfare comes first. Each member of AA is a small aspect of a larger whole. Group welfare and support come first, with individual health and safety coming in a very close second. There is one ultimate authority, which is a loving God. The loving God does not need to be the Christian God. Rather, this is God as the ultimate authority in whatever form works for each group’s collective consciousness. The desire to stop drinking is the only membership requirement. No one is turned away if they wish to overcome alcohol abuse. Membership with the group is based only on abstinence from alcohol and following the 12 Steps, not on money or conformity. Any two or more individuals using the 12 Steps to overcome alcohol use disorder and problem drinking can use the name AA if they have no other affiliation. Each AA group is autonomous, except in matters affecting all groups. There is no centralized AA authority that affects individual groups; the group is responsible only to the group’s conscience. The one exception involves neighboring AA groups, which should be consulted if one group’s decisions affect others. No regional committee or individual member should take an action that affects the AA group, nor should regional authorities or individual members take actions that affect AA as a whole without consulting the General Services Board. The common welfare is paramount. Each group’s primary purpose is to carry the message to those still struggling with alcohol. Each AA group is essentially a spiritual entity whose higher purpose is to save those who still struggle with problem drinking by bringing their message of hope. AA does not give money, endorsement, or prestige to organizations outside the group’s mission. The problems of money, property, and authority divert group members from their process of recovery, and may add stress that can prevent them from being successful. Facilities used for meetings should not use “Alcoholics Anonymous” in their name. Any property used by the AA group should be owned and managed separately from the members, maintaining the divide between the spiritual and material. The AA group should never go into business as an entity, although individual members should have or work toward gainful employment. Cooperating with individuals, businesses, or organizations is encouraged, but not to the point of endorsement, whether implied or actual. Each group must self-support and decline outside contributions. Individual members who are able to should contribute financially to any needs the group has. Public solicitation of funds, to support the AA group, individual members, or the overall AA movement, is unwise and can pull focus from the group’s collective success to material struggles. It is also important that individual AA group treasuries do not accumulate more money than what is required for specific AA purposes. The core of the group meetings is nonprofessional, peer support. In the context of AA leadership, “professionalism” is defined as a trained counselor whose occupation is to provide therapy for fee or hire. AA does not employ these professionals to lead groups, but instead focuses on the mutual support of peers helping each other through. Sometimes, AA hires members to perform specific services that help the group or regional organization, but these tasks never include leading the group. There is no central organizing body. As little organization as possible should be used to maintain the group’s identity. Leadership should rotate. There are some elected positions, including a secretary for minutes and a committee, but these positions should frequently cycle. The trustees in the General Service Board in New York are custodians of the overall AA Traditions and Steps, and maintain contributions and public relations. They also print the AA Grapevine However, the General Services Board has no authority over specific groups, and they do not govern; their focus is on serving AA as a whole. AA remains apolitical, with no opinion on outside issues. AA members should not use the group identity to express support or opposition to issues outside AA itself. These include political views, sectarian religion, or alcohol reform. AA opposes no one and exists to help people struggling with alcohol abuse. Personal anonymity of members is deeply important. Anonymity exists to protect group members from public scrutiny and opinion. AA should avoid sensational advertising, and the names, faces, or other identities of members should never be used to promote the program, shame members, or otherwise attract attention. Praising groups or individual members is unnecessary; recommendation to AA should be only for those in need of help. Anonymity is the spiritual foundation of the traditions, placing principles above personalities. The principle of anonymity has spiritual significance, allowing members the freedom to express their struggles and their completion of the steps. Anonymity reminds members to focus on principles above personalities, and to practice genuine humility. Blessings cannot spoil members, nor can failures stop spiritual growth.